we worked secretively on this new module in the last few months, and now we would like to present it officially on the site. 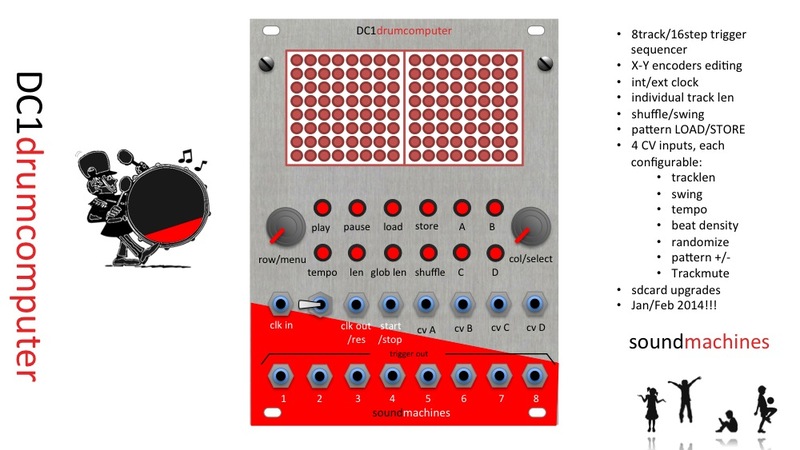 The DC1drumcomputer is a pattern based trigger sequencer with many traditional features and a handful of twists for your beat/trigger creativity. It is an 8 track 16step trigger seq with Load/Store capabilities (up to 128 patterns), pattern lenght (global), track len (for each one! ), swing/shuffle, internal clock generation or external slave-ing, and the classical start/stop/pause commands. 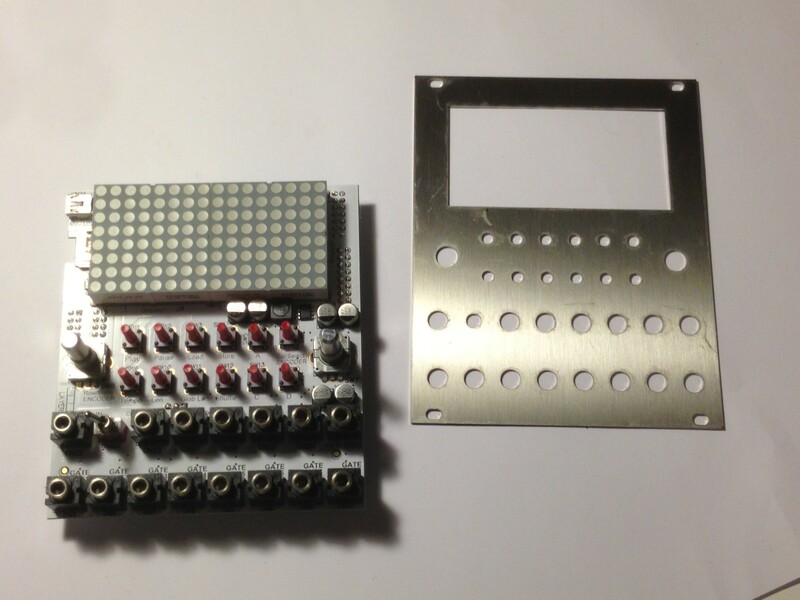 The interface is a etch-a-sketch, or X-Y based, by means of a dotmatrix led display and two encoders with pushbutton. In any state, you can ‘point’ the step that you want to activate/deactivate with the encoders and push to change its state. The encoders are metal shaft, automotive type products to ensure durability and stiffness. The twists are coming in the form of 4 independent CV inputs that are totally configurable, each one, to influence the following stuff: bpm, track lenght (individual! ), shuffle, beat density, pattern jump, randomize, track mute, etc…. By pressing the CVin button (A,B,C,D) and simply turning the encoder you enable the input to change the parameter that is shown in pseudomnemonic code on the display. The following picture shows the prototype!